To protect oak trees and help prevent oak wilt, the Wisconsin Department of Natural Resources advises people to avoid pruning oaks on their property from April through July. Spring and early summer pruning makes oak trees vulnerable to oak wilt, a fatal fungal disease that rapidly kills trees in the red oak group and weakens those in the white oak group. Any tree damage during this time creates an opening that exposes live tree tissue and provides an opportunity for the oak wilt fungus to infect the tree. The red oak group includes northern pin oak, northern red oak, red oak and black oak; the white oak group includes bur oak, swamp white oak, white oak and English oak. 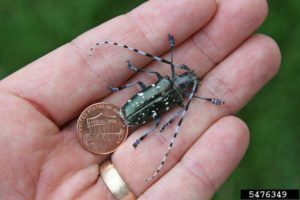 “It takes only a few minutes for beetles that carry oak wilt spores to land on a fresh wound and infect your tree,” said Paul Cigan, DNR forest health specialist in Hayward. Property owners with oak trees are encouraged to check with their municipality to find out if there are local oak wilt ordinances which may have different pruning restrictions. The use of tree paint or a wound dressing is not normally recommended on pruning cuts or wounded surfaces on most trees. 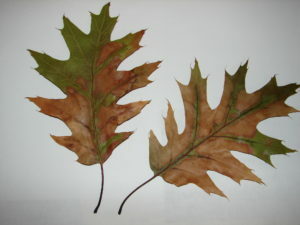 But for damaged oaks, the use of such products are suggested from April through July. An immediate light painting of wounds or cuts on oak trees during this time helps protect against the spread of oak wilt by beetles. Don Kissinger, a DNR urban forester in Wausau, said there are also other important reasons to avoid pruning many kinds of deciduous trees in spring beyond concerns about oak wilt. “Spring is the time when tree buds and leaves are growing, leaving the tree’s food reserves low,” Kissinger said. In general, the best time to prune trees is in winter. Oak wilt and other diseases move easily on or in firewood logs year-round. To protect trees in general, don’t move firewood long distances, or only use firewood labeled as Wisconsin-certified. 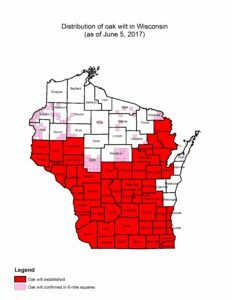 As of January 31, 2018, oak wilt has been found in all Wisconsin counties except Douglas, Bayfield, Ashland, Iron, Forest, Taylor, Door, Kewaunee, Calumet, and Manitowoc counties. Several of these counties contain the highest abundance of healthy and productive oak forests in the state. Taking recommended precautions with living oak trees and keeping firewood local to prevent the spread of oak wilt will help keep them that way for years to come. An adult emerald ash borer. The Wisconsin Department of Agriculture, Trade and Consumer Protection (DATCP) enacted a statewide quarantine for the invasive insect emerald ash borer (EAB) on March 30, 2018. Previously, individual counties were quarantined when EAB was confirmed within each’s borders. 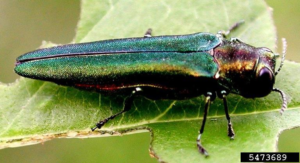 Since EAB has been found in 48 of 72 Wisconsin counties, DATCP officials have determined that statewide regulation of the devastating ash tree pest is warranted. Movement of ash wood, untreated ash products and hardwood firewood of any type to areas outside of Wisconsin will continue to be regulated by USDA’s Animal and Plant Health Inspection Service, Plant Protection and Quarantine. (APHIS PPQ). Within the state, Wisconsin businesses and members of the public will be able to freely move ash wood, ash products, and hardwood firewood to or from any Wisconsin county. Firewood restrictions will remain in effect on state and federal lands. Items affected by the statewide EAB quarantine include ash wood with bark attached, larger ash wood chips, and hardwood firewood of any kind. County-by-county quarantines for gypsy moth, another invasive forest pest, remain in effect. The move to a statewide quarantine does not mean that the state has given up on managing EAB; it is simply a shift in strategy as EAB continues its slow spread through the state. The Wisconsin DNR will continue releasing tiny, stingless wasps -natural enemies of EAB – at appropriate sites, which it has done since 2011. The DNR also continues participation in silvicultural trials in which different ash management strategies are being tested. Most importantly, campers, tourists, and other members of the public are strongly encouraged to continue taking care when moving firewood within the state. “The actions taken by the Wisconsin public during the last few years have significantly slowed the spread of emerald ash borer and other invasive forest pests in the state,” said Wisconsin DNR EAB program manager Andrea Diss-Torrance. “We can continue to protect the numerous areas within our state that are not yet infested – including those in our own backyards – from tree-killing pests and diseases by following precautions.” Public members should continue to obtain firewood near campgrounds or cabins where they intend to burn it, or buy firewood that bears the DATCP-certified mark, meaning it has been properly seasoned or heat-treated to kill pests. Emerald ash borer is native to China and probably entered the United States on packing material, showing up first in Michigan in 2002. It was first found in eastern Wisconsin in 2008. Have you noticed any trees this winter with the bark partially or mostly removed? These trees can stand out dramatically during the winter. Woodpeckers remove outer layers of bark so that they can more easily punch their beaks through the remaining bark to get at the tasty, plump larvae underneath. The three most common trees that you’ll spot this damage on in Wisconsin are elm, tamarack, and ash. So, what’s going on? On elm, there are three bark beetles of interest. 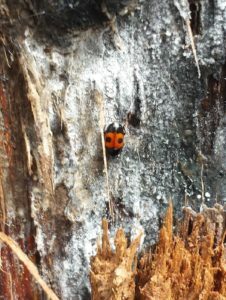 One is a native beetle, and two are exotic species – the smaller European elm bark beetle and the banded elm bark beetle. Adult bark beetles chew their way under bark and lay eggs during the spring or summer. The eggs hatch, and larvae begin feeding in the tree layers under the bark. Going into winter, larvae are plump and delicious (if you’re a woodpecker), and it’s these juicy morsels for which the woodpeckers will strip the outer bark from the tree, sometimes starting at the ground and working all the way to the top. Elm trees will often appear a rich red or burgundy color when outer bark is removed. The U.S. Forest Service offers a document with additional information on elm bark beetles, as well as photos of each of them. 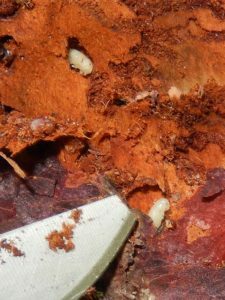 Close-up of tamarack bark, showing the larvae of Eastern bark beetle at the tip of my (broken) knife. Woodpeckers remove the outer bark to make it easier to access these tasty morsels. Tamarack trees (often referred to as larches) are attacked by a bark beetle as well. 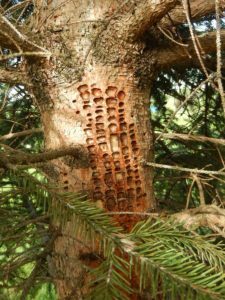 Eastern larch beetles attack stressed tamarack trees, although sometimes the stress is so minor that it’s not easily identifiable. The wet weather we had throughout the 2017 growing season definitely stressed some of tamaracks in Wisconsin; having roots in fully saturated soils for too long a period when the tree is actively growing can cause root mortality. Tamarack that have had the outer bark stripped off will appear dark red in color. More information on eastern larch beetle from the U.S. Forest Service can be found here. Ash bark with pale areas where woodpeckers have removed outer layers of bark, as well as some small rough holes where the woodpeckers punched through bark and plucked out a nice plump EAB larvae. Ash trees with the outer bark removed may be infested with either emerald ash borer or a native ash bark beetle. When woodpeckers remove outer bark of an ash tree, it makes the tree look very pale. Emerald ash borer populations build up to very high numbers as they move into new areas, which provides a great source of food for woodpeckers. 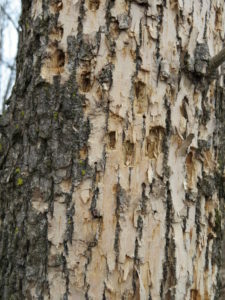 A study published in 2012 showed that woodpecker numbers can increase due to the presence of EAB. What about other woodpecker damage that you see on trees? to say that they won’t occasionally peck into a healthy tree, but the insects they prefer to feed on are more common in dead or severely stressed trees, or trees with a lot of decay in them. Pileated woodpeckers have tongues containing backward facing barbs that they can stick into an insect gallery to drag out the occupants for a meal. They can leave a pile of good-sized woodchips at the base of trees that they’re feeding in. The photo shows an example of the damage that they can do. 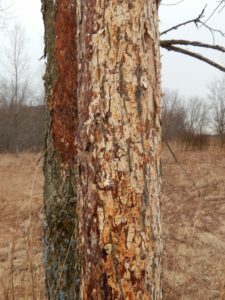 Sapsuckers are birds that drill orderly rows of holes through the bark of trees. The holes go through the bark to the cambial layer, causing the tree to “bleed” sap. Sapsuckers return to feed when the sap is flowing. Sapsuckers’ tongues have little hairs on them to help gather sap. Sapsuckers are migratory and may just pass through an area in the spring, but they will sometimes return to the same tree over multiple years, creating new rows of holes each year. Trees will attempt to grow over this damage, and are usually successful, although the damage to the bark may remain visible for many years. Loggers may note this damage when cutting logs; it is referred to as “bird peck”, and is considered a defect. Federal regulations prohibit people from killing sapsuckers, so control for yard trees is usually some manner of deterrent such as wrapping the main stem with hardware cloth or burlap, or using scare tactics in the tree. Orderly rows of holes created by yellow-bellied sapsuckers. These birds will revisit these holes that they drill and lick the sap that flows from them. 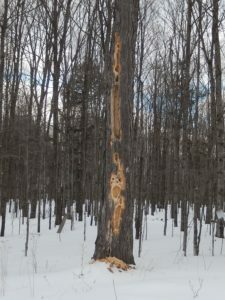 Damage from pileated woodpeckers can be quite extensive. A single woodpecker can create this level of damage in a few days, or it may work at a tree throughout the season. Note the pile of large woodchips at the base of the tree. Written by: Linda Williams, forest health specialist, Woodruff. Linda.Williams@wisconsin.gov, 715-356-5211 x232. 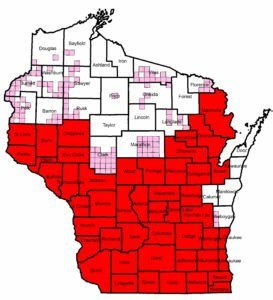 A new Wisconsin Wildcard is available on beech bark disease (BBD). 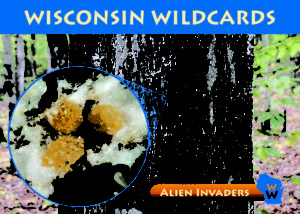 Wisconsin Wildcards are pocket-sized, collectible informational pieces available at Wisconsin state parks. The BBD Wildcard may be viewed at https://p.widencdn.net/clz4yw/Beech-bark-disease-wildcard and ordered by emailing a request to Forestry.Webmail@wisconsin.gov (ask for publication no. FR-218x). 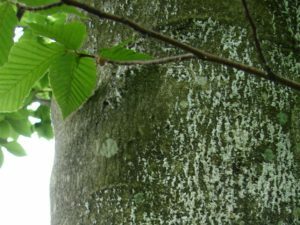 Beech bark disease will eventually become a problem wherever beech is found. The native range of American beech (Fagus grandifolia) extends into the eastern third of Wisconsin. BBD is the result of a relationship between exotic scale insects and a Neonectria fungus. The disease was first identified in Wisconsin in 2009. Currently, the only known area of the state which has experienced mortality from BBD is Door County. Front and back of the new beech bark disease Wisconsin Wildcard. The scale insects feed by inserting their mouthparts through the bark on the trunk and branches and sucking the sap from the tree. The fungus, which “hitchhikes” on the scale insects’ bodies, enters the tree through those wounds. The tiny scale insects secrete a white waxy protective covering; when scale populations explode and there are millions of scales on a tree, the tree can appear white from a distance, making it resemble a birch tree. As the fungus enters the tree at numerous points and dead spots under the bark (called cankers) form, the tree becomes weakened, leading to a risk of “beech snap.” Beech snap can occur unexpectedly when the tree still has a full canopy of leaves remaining. 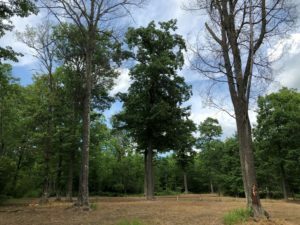 Beech snap can create huge problems for park and campground managers who are trying to keep guests safe; there is no way to predict when a tree is going to fail from BBD. Eventually, the insects and disease take their toll and the beech trees decline and die. Any age of beech tree can be infested, so in stands with significant beech mortality, regenerating trees will become infested as well as mature ones. 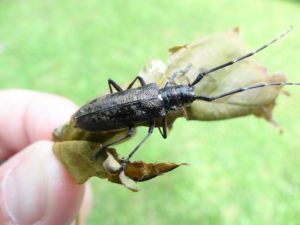 The good news is that three to five percent of American beech trees are resistant to BBD. Michigan has identified and propagated such trees for a number of years, and have established a seed orchard of resistant trees. BBD is not yet as established in Wisconsin, but already we’ve been able to identify a couple of resistant trees in the area where BBD has killed many trees. 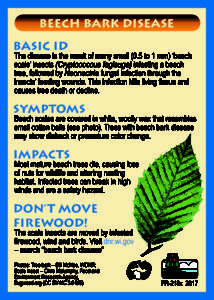 For more info on beech bark disease, visit Wisconsin DNR’s webpage on BBD. Dutch elm disease seems to be quite prevalent around the state this year, including the northwoods. Symptoms, including whole tree yellowing and wilting have been occurring this summer, and will continue into this fall. Dutch elm disease is an exotic fungal disease that is spread by the elm bark beetle and can spread underground through root grafts as well. Since bark beetles are generally not attracted to smaller trees (sapling to small pole size) people often get their hopes up that their small elms have “escaped” and will survive and grow to maturity. Unfortunately, as soon as the trees are large enough for the bark beetles to be interested in them the trees may become infected with Dutch elm disease. The first symptom you will see is usually a single branch on which the leaves turn yellow and die. The rest of the tree will die shortly after that. Elm trees attempt to fight the fungus by walling off the portion of the tree where the fungus is located but this can lead the tree to self-induced water deprivation and death. More info on Dutch elm disease, including useful pictures, can be found in the U.S. Forest Service document How To Identify and Manage Dutch Elm Disease. 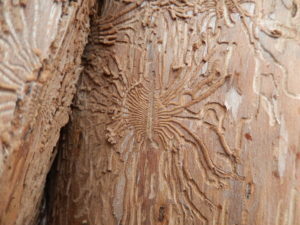 Dutch elm disease is spread by elm bark beetles, which create artistic galleries under the bark of the tree. Chemical injections can protect single trees, and some communities in North America still have large stately elms due to this strategy. For new plantings, there are some disease resistant cultivars (those crossed with other elm species) and some disease “tolerant” cultivars of American elm which tolerate the disease without completely killing themselves. Oak leaves from an oak wilt infected tree. The outer portions of the leaf will be brown or have a water-soaked appearance. Part of the leaf remains green even though the leaf has dropped off the tree. 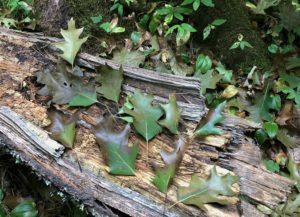 Trees that were infected with the oak wilt fungus this spring, (whether from overland spread by beetles or underground spread by connected root systems) are beginning to drop their leaves. Leaves can drop anytime between July and September. This wilting and dropping of the leaves happens fairly quickly, and trees can go from looking nice and healthy to having lost most of their leaves within just a few weeks. This year I saw my first wilting oaks on June 28, although in areas further south the leaf drop may have begun earlier. 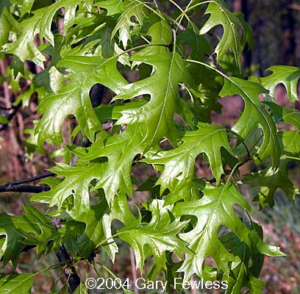 Oak wilt is a non-curable, fungal disease specific to oaks. Once the fungus infects a tree it will begin to spread outward from the roots of the infected tree through grafted roots and into the roots of neighboring oaks, eventually killing the neighboring oaks. In this way pockets of dead oak will be created as each year more oaks die. For more information on oak wilt biology, prevention, and control check out the WI DNR’s oak wilt page. Firewood from trees that have died from oak wilt will remain infectious for 1 full year (12 months) after the tree has died. There are many areas of northern Wisconsin where oak wilt is not common. Please do not move firewood long distances because you could move oak wilt into a new area. Many northern counties don’t have oak wilt or have only a few known infections. This map shows townships in the north where oak wilt has been identified. In the red counties oak wilt is considered to be scattered throughout the county, although it will not be found in every stand.